A native of Persia. Flowers in February and March. Its beauty, early appearance, and fragrant blossoms, make it highly esteemed by all lovers of flowers, like the Hyacinth or Narcissus it will blow within doors in a water glass, but stronger in a small pot of sand, or sandy loam, a few flowers will scent a whole apartment it will also blossom in the open air, but requires warmth and shelter, it is propagated by offsets and seeds, the best flowering roots are imported from Holland, they bear forcing well, and hence this plant may be had to flower a full month or six weeks in succession. This species differs from the other plants of the genus, in the colour of its outermost petals, which are long, narrow, purple, and pendulous, and not unaptly resemble small pieces of red tape. Notwithstanding it is a native of the warm climates Carolina and Virginia, it succeeds very well with us in an open border but, as Mr. Miller very justly observes, it will always be prudent to shelter two or three plants under a common hot bed frame in winter, to preserve the kind, because in very severe winters, those in the open air are sometimes killed. It flowers in July. As it rarely ripens its seeds with us, the only mode of propagating it, is by parting the roots, but in that way the plant does not admit of much increase. Grows wild in Lombardy, Italy, and Austria, affects mountainous situations, flowers with us in February, and hence is liable to be cut off by severe frosts. Is propagated by offsets, which the roots send out in plenty. These roots may be taken up and transplanted any time after their leaves decay, which is generally by the beginning of June till October, when they will begin to put out new fibres, but as the roots are small and nearly the colour of the ground, so if care is not taken to search for them, many of the roots will be left in the ground. These roots should be planted in small clusters, otherwise they will not make a good appearance, for single flowers scattered about the borders of these small kinds are scarce seen at a distance, but when these and the Snowdrops are alternately planted in bunches, they will have a good effect, as they flower at the same time, and are much of a size. Grows wild in many parts of Italy and Germany, and is sometimes found with white flowers, if the season be mild, or the plants sheltered from the inclemency of the weather, this species will flower as early as February, or much earlier by artificial heat. 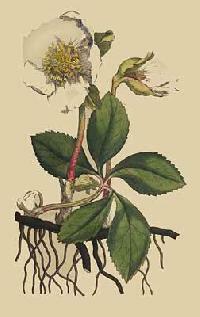 As it grows naturally in woods and shady places, it will thrive best in a mixture of bog earth and loam placed in a north border, if planted in the open border, it will require to be covered with a hand glass during winter, and in the spring, when in bloom, the more usual method with gardeners is to preserve them in pots in a common hot bed frame, the advantage of this method is that they may, at any time, be removed to decorate the parlour or the study. The plants of this genus admit of but little increase by their roots, the best method of propagating them is by seed, which should be sown soon after they are ripe in boxes or pots, and covered about half an inch deep, placing them where they may have only the morning sun, till the beginning of September, when they may be removed to a warmer exposure. 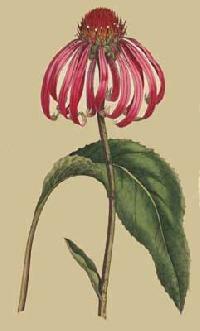 Of this genus Mr. Miller makes two species, Linnaeus, perhaps with more propriety, only one, for breadth of leaves or colour of flowers can scarcely be considered as sufficient to constitute a specific difference. It is found in the gardens with purple flowers of two different tints, also with white and yellow blossoms, grows naturally in Hungary and some parts of Italy, and blows in the open border at the beginning of April. They are propagated by offsets from their roots. They love a shady situation and a gentle loamy soil, but should not be too often removed. They may be transplanted any time after the beginning of June, when their leaves will be quite decayed, till the middle of September, but the roots should not be kept very long out of the ground, for if they shrink it will often cause them to rot. The roots of these flowers should not be planted scattering in the borders of the flower garden, but in patches near each other, where they will make a good appearance. We are not a little surprised that Mr. Miller should have taken no notice of the present species, as it must have been in the English gardens long before his time, being mentioned by Parkinson in his Garden of pleasant Flowers it is nearly related to the Pseudo Narcissus, but differs from it in many particulars except size, vid. Lin. Sp. Pl. and Parkinson above quoted. 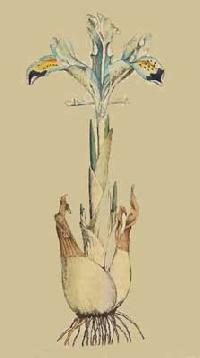 Though its blossoms are not so large as those of the other species, yet when the roots are planted in a cluster, they make a very pretty shew, and have this advantage, that they flower somewhat earlier than any of the others. 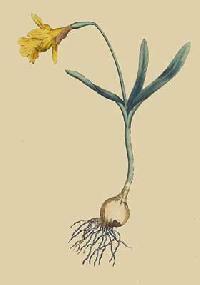 Like the common Daffodil it propagates very fast by the roots, and will thrive in almost any soil or situation. Though a native of Spain, it is seldom injured by the severity of our climate. 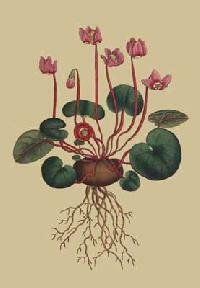 A native of Spain, Portugal, and Carniola, and an inhabitant of woods and shady situations, flowers in March and April in the autumn it puts forth trailing shoots, which take root at the joints, whereby the plant is most plentifully propagated, thrives best under a wall in a North border. As our Publication seems likely to fall into the hands of such as are totally unacquainted with Botany, or botanical writings, it must plead as an apology for our often explaining many circumstances relative to plants, which may be well known to adepts in the science. 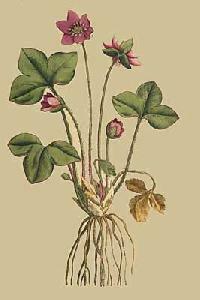 This plant derives its first name from the black colour of its roots, its second from its early flowering, and the colour of its petals, which though generally milk white on their first appearance, yet have frequently a tint of red in them, which increases with the age of the blossom and finally changes to green, in some species of Hellebore, particularly the viridis, the flower is green from first to last. 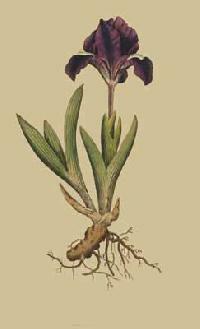 Black Hellebore grows wild on the Appenine and other mountains, preferring such as are rocky. If the weather be unusually mild, it will flower in our gardens, in the open border, as early as December and January, it may indeed be considered as the herald of approaching spring. Like most other alpine plants, it loves a pure air, a situation moderately moist, and a soil unmanured as the beauty of its flowers is apt to be destroyed by severe frosts, it should be covered during the winter with a hand glass, or if it be treated in the manner recommended for the round leavd Cyclamen, it may be had to flower in still greater perfection. It is propagated by parting its roots in autumn neither this species nor the hyemalis thrive very near London. Gardeners, in former days, not having that profusion of plants to attend to and cultivate, which we can at present boast, appear to have been more solicitous in increasing generally the varieties of the several species, accordingly, we find in the Paradisus terrestris of the venerable Parkinson, no less than six varieties of this plant, most of which are now strangers to the Nursery Gardens. We may observe, that varieties in general not being so strong as the original plant, are consequently much sooner lost. The Iris pumila grows wild in many parts of Hungary, affects open and hilly situations, and flowers in our gardens in the month of April, it is a very hardy plant, and will thrive in almost any soil or situation, is propagated by parting its roots in autumn. 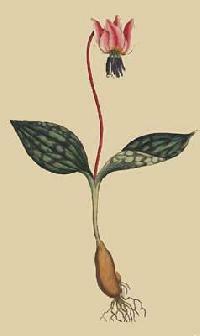 Dillenius, Miller, and some other authors, make a distinct genus of the Hepatica Linnaeus unites it with the Anemone, observing, that though it differs from the Anemone in having a calyx, yet that calyx is at some distance from the flower, and partakes more of the Nature of an Involucrum, which is not uncommon to the Anemonies. The Hepaticas, as Parkinson observes, flower soon after the winter Hellebore, and making their pride appear in winter, are the more welcome early guests. 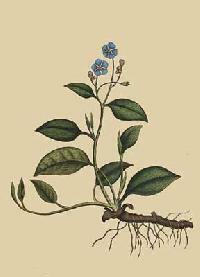 It is found wild in its single state, with red, blue, and white flowers, in the woods and shady mountains of Sweden, Germany, and Italy, the red variety with double flowers is the one most commonly cultivated in our gardens, the double blue is also not unfrequent, the single white is less common, and the double white Miller never saw, yet admits that it may exist spontaneously, or be produced from seed Parkinson mentions a white variety with red threads or stamina. 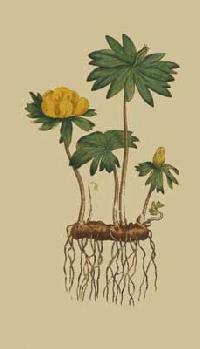 According to Miller, this plant delights in a loamy soil, and in an eastern position where it may have only the morning sun the single sorts are easily raised from seed, the double, increased by parting the roots, which ought to be done in March when they are in bloom, they should not be divided into very small heads these plants, if often removed and parted, are apt to die, but left undisturbed for many years, they will thrive exceedingly, and become very large roots.